Let's say you run a Charity site, and you want the donation amount to be a recurring option once your users pledged a donation. This user guide will show you how to enable a recurring custom amount donation on the form using our Payment Fields. In the demo form above, the donor can either select a predefined donation amount or manually provide an amount they prefer to donate. The different custom donation selection also have different recurring periods that will allow flexible scheduling of recurring donations. If you want to give your users the freedom of deciding how long they want the recurring donation to stay active, then pick USER SELECTED on the NUMBER OF PAYMENTS section. Repeat all the steps for each Subscription if you need to add more. 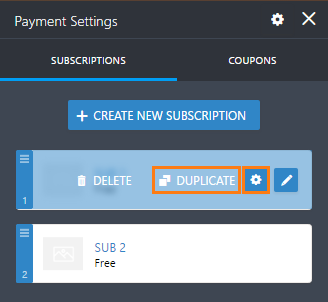 Alternatively, you may also duplicate your Subscriptions by clicking the GEAR icon then DUPLICATE. Afterwards, make further changes to the duplicate if needed. JotForm also offers a wide selection of Donation Form Templates, check them out here. How a recurring subscription can be canceled at any given time? Authorize.Net - Subscription must be canceled by you from the Authorize.Net account dashboard. Stripe - Subscription must be canceled by you from the Stripe account dashboard. PayPal - Users allowed to cancel their subscriptions from within their PayPal accounts. 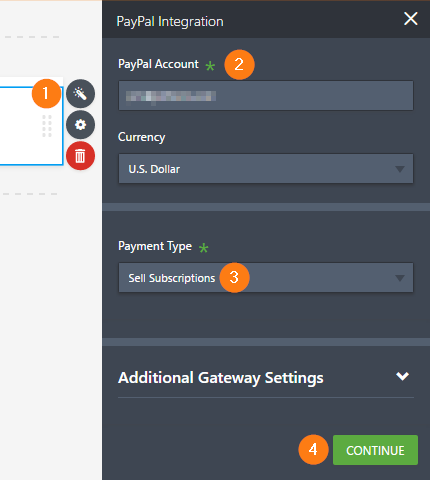 You can also cancel the subscriptions from your PayPal account dashboard. Questions? Contact us in our Support Forum. Once a user commits to a recurring donation, how do they go about cancelling it? Is there a way to just have it merge the type and amount of gift? We are using Authorize.net, if that matters. I have square and I cannot find the subscription option. Does that feature not work with Square? I am using Authorize.net Integration. How do I give the option for ONE TIME gift or MONTHLY recurring gift? This does not match what is on the Jotform BUILD page. I can not find anything that offers RECURRING donations. Can I add a one-time donation in addition to the recurring choices? Does this set-up work for Stripe? I do not see the Number of Payments option in the Stripe configuration menu. I do not have the sell subscriptions option in anything I see available to me.